Even though smartwatches like the Samsung Galaxy Gear and Pebble are just starting to penetrate the market, it looks like they could soon be overshadowed by smart rings. 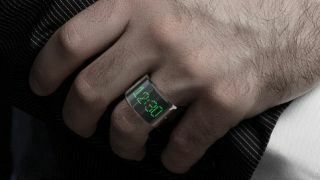 Although consumers won't quite be able to channel their inner Green Lantern and speak to their fingers, the Smarty Ring, a project that launched on Indiegogo, claims it will bring smartphone connected wearable devices to the jewelry world. The 13mm-wide stainless steel ring features a built-in, curved LED screen that displays the typical notifications users are accustomed to seeing on their smartphones. The screen lights up with icons for incoming caller IDs, text messages, and updates from social networks. The ring's screen is flanked by two physical buttons that control apps and can trigger a smartphone's camera. Another neat feature having to do with a handset is an anti-theft warning that goes off when the ring and phone stray more than 30 feet away from each other. The Smarty Ring is said to be able to do all this through a Bluetooth LE connection. It supports both Android and iOS as long as the device has Bluetooth 4.0. In another lofty lob, the ring's creators say the device has a 24-hour battery life coming from a 22mAh battery, which happens to charge through a wireless induction pad. With this spec, the ring's battery has more than 10 times less energy storage capacity than the 315mAh equipped Samsung Galaxy Gear, which promises 25 hours of operational time. That said, in our review we found the Korean smartwatch actually lasted for even more time than Samsung originally let on. The same thing could happen with the Smarty Ring, but we won't know until we really get our hands – err fingers on it. Much like the Pebble smartwatch, the Smarty Ring has blown past it's initial $40,000 (about £24,395/AU$44,125) fundraising goal. As of this writing, the project has a little less than 12 hours to go and is currently sitting at $223,436 (about £136,270/AU$246,482) in funding totals. Those that want to get their fingers wrapped with this fully featured smart ring can do so by preordering one on Indiegogo for $175 (about £106/AU$193) with free international shipping. There are also a number of stripped down versions that only feature a watch and other bits like the phone tracker. The creators estimate the Smarty Ring will begin arriving to backers around the world by April 2014. Microsoft's next gen Xbox One sells out at most major retailers with over 2 million sold in under three weeks.